URBANA, Ill. – West Nile virus was recently found to be present in a dead bird collected in Champaign County, bringing to 25 the number of counties in Illinois reporting the presence of the virus this year. Although no human cases of the virus have been reported, University of Illinois Extension entomologist Phil Nixon says it’s best to be extra diligent to protect yourself. One easy way to prevent mosquitoes from becoming a nuisance when you're outside, Nixon said, is to keep a fan blowing on your deck or patio. "Mosquitoes are not very good at flying, so they need air to be still in order to land and bite. Keep the air circulating with a fan blowing over the area where your guests are outside." Nixon said that one of the biggest problems is clogged gutters. "The northern house mosquito loves to breed in stagnant, even putrid water, so cleaning out gutters and other places water collects is one of the best things homeowners can do." 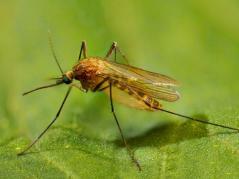 The northern house mosquito is a small, medium brown, quiet biter meaning that it lands softly on the skin and the bite is painless enough that many people don't even know they've been bit. It doesn't buzz around your ear like other mosquitoes do. It bites both birds and humans. That’s how the West Nile virus gets transmitted, Nixon said. Nixon said that there is a vaccine to prevent West Nile virus for horses. "The mortality rate for horses is 30 percent," he said. For more information, visit www.ipm.illinois.edu/wnv/.